The UK's Secretary of State for Defence Liam Fox called for the ban of Medal of Honor for being "tasteless". He later defended his remarks. EA, the game's publisher, has now retorted. EA Games president Frank Gibeau tells website Develop that Medal of Honor will not be altered due to the outcry of politicians or the media. Soldiers have opinions for and against the title. 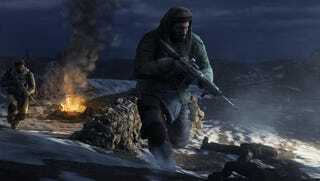 The upcoming Medal of Honor features multiplayer that allows gamers to play as Taliban fighters. The game is set in Afghanistan. "There's a lot of furore around games that take creative risks – like games that let you play terrorists in airports mowing down civilians," Gibeau told Develop, referencing Call of Duty: Modern Warfare 2. "At EA we passionately believe games are an artform, and I don't know why films and books set in Afghanistan don't get flack, yet [games] do. Whether it's Red Badge Of Courage or The Hurt Locker, the media of its time can be a platform for the people who wish to tell their stories. Games are becoming that platform." Gibeau continues, saying that EA anticipated the controversy "What's really important for us is that we partnered with the US military, and the Medal of Honor Society as well. We've gone out of our way to produce the best story for the game." One of the worst things about controversies like this is that they cast aside something truly important: Is this a good game?